Okay, technically a truck, but it's a vehicle, so I think it counts. 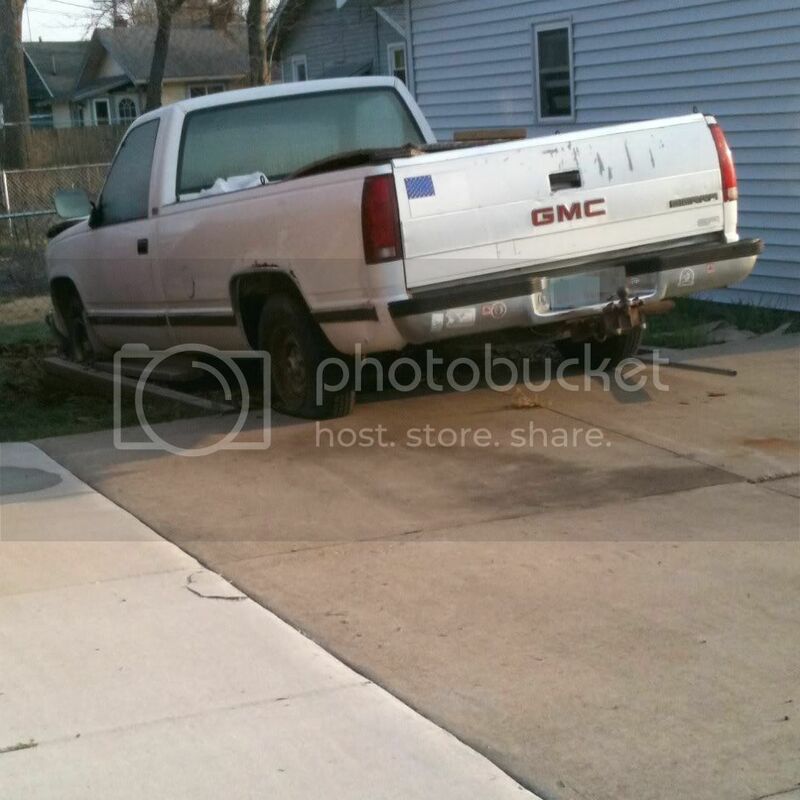 Maybe you can't tell from the photo, but the driver of this truck completely overshot his driveway. The hood is crumpled. One rear tire is flat, but it's still in better shape than the front tire, which is totally missing. The bed of the truck, on the other hand, is full of tires. I believe this is referred to as "irony." I found this lovely vignette on a walk through my neighborhood, though it's been there, unmoved, for quite some time. I don't know the driver personally, but while looking at his vehicle several thoughts occurred to me. I need to move to a nicer neighborhood. I'm willing to bet he failed driver's ed (the parking portion, at least). Judging by how long it's taking him to fix it, he might not be as good a mechanic as he thought he was. Either that, or replacement parts for a 1987 GMC ElCrapo are really hard to get. This is one of the only situations when you'd be sorry your property didn't have a sink hole on it. That's twice this week I've made you look at junky trucks - I sincerely apologize for that. But you're already here, so you might as well click below to vote for me! Wow. Well, on a positive note, at least they didn't hit the house? And on a second positive note-look at me, being all positive!-you got a funny blog post out of it. Win-win! i blew soda out my nose reading this. okay, i wasn't drinking soda, but i involuntarily blew my nose laughing while reading it, so HAD i been drinking some, it certainly would have come out my nose. that was a close call. 3rd Party, that WAS a close call. I trust you cleaned off the keyboard before I came up here to use the computer. i didn't have any snotties. it was just air.